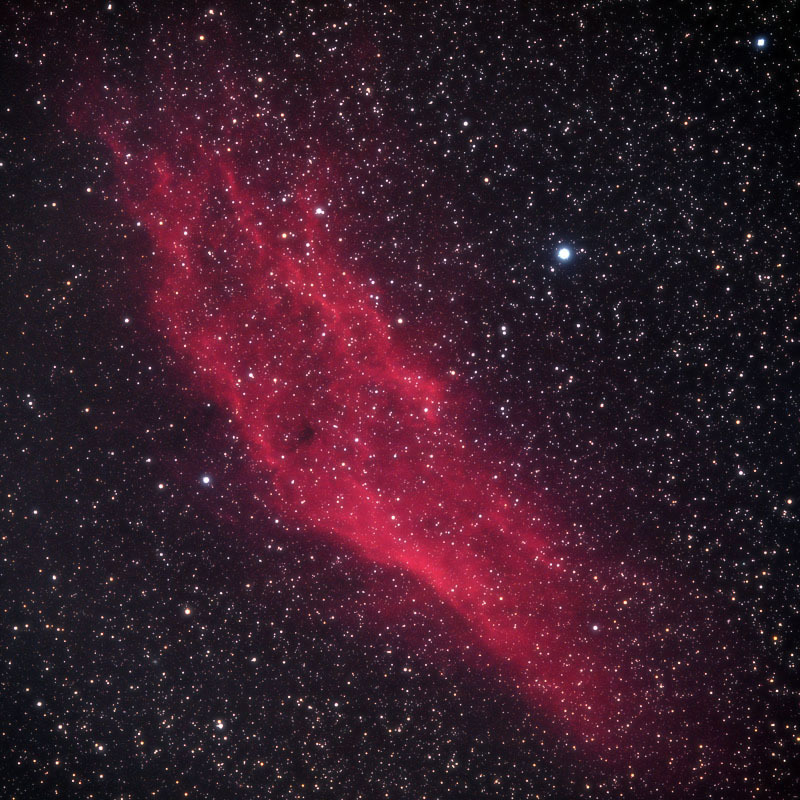 The California Nebula NGC 1499 was discovered by E.E. Barnard in about 1884-5, just in time to have it added in Dreyer's NGC. Under very dark skies, it can just be glimpsed with the naked eye. Because of its low surface brightness, it is not much easier when visually observed in telescopes. Instead, this nebula is a great target for astrophotographers. NGC 1499 is probably illuminated by Xi Persei, a hot blue-white main sequence star of spectral type O7e. This star belongs to an association of young stars which probably arose from this interstellar cloud, the Perseus OB2 association. It is the hottest star of this association. Situated 0.6 deg S of the California Nebula is the brightest star of Per OB2, Zeta Persei, a B1 Ib white supergiant which shines at mag 2.83. At its distance of about 1000 lightyears; this corresponds to the luminosity of 6300 suns like ours, or an absolute magnitude of -4.7. This star has an annual proper motion of 0.02" and is receding from us at about 20 km/s, and probably a remote physical companion. 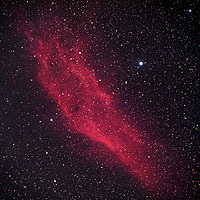 The image in this page was created by Russ Dickman; see his NGC 1499 page.